UWAGA! LEKKO PĘKNIĘTY GRZBIET OKŁADKI. 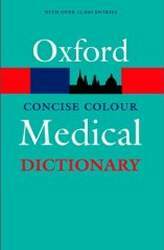 This best-selling and market-leading dictionary contains over 11,000 clear and concise entries, covering all aspects of medical science. Written by a team of medical experts, the entries are accessible and jargon-free, and complemented by over 140 illustrations and diagrams. Now in its 4th edition, the dictionary has been fully revised and updated to cover changes in this fast-moving field. Entries on techniques and equipment, drugs, general medical practice, health service organization, and treatment have all been reviewed, and updated where necessary. The dictionary has also been expanded in many areas, notably medical ethics, clinical governance, emergency medicine, pathology, and diagnosis. Selling over 650,000 copies in previous editions, this is an indispensable reference guide for students, as well as those working in the medical and allied professions. It is also an invaluable home reference guide for the general reader.